When it launches tonight, Overwatch League will become the biggest undertaking in the history of esports. Backed by massive investments from sports billionaires and tech companies, esports, if you choose to believe the hype, has finally grown up. And yet, despite the fact that Overwatch League is ostensibly a global undertaking with teams “based” on several continents, its first season will be constrained to a studio in Los Angeles. Pomp and circumstance aside, Overwatch League is very much a work in progress. That’s not a criticism, or a bad thing; overexpansion has killed many ambitious tournaments over the years. But the out-of-game structures that are nearly as popular in major sports as the games themselves—think: trades, contracts, palace drama—is also in its infancy. Millions of people have played Overwatch, but until today, no one has truly competed in Overwatch League. Though esports fans usually use “metagame” to refer to whatever strategies are in vogue in-game, the concept is just as relevant outside that context. OWL’s deep-pocketed investors are themselves involved in a kind of lucrative metagame, while coaches and managers are trying to figure out what kind of organization works best for winning OWL matches. So what’s the metagame of Overwatch League right now? The most obvious question for any kind of sports enterprise is figuring out how to make it profitable and/or competitive. In baseball, say, the complex interconnected systems of scouts, statisticians, batting coaches, developmental leagues, backups, and so on has come to feel like a given, but it’s the result of many decades of trial and error. Part of what makes Overwatch League so fascinating is that its inaugural teams are trying to compress that evolutionary process into a period of a few short months. Unsurprisingly, there’s quite a bit of variation among teams in how to address even the most basic aspects of OWL, which means wildly different approaches to things like roster size, team houses, and language barriers. These metagames say quite a bit about what kind of game Overwatch League might be. Nowhere is that more clear in the variation in roster size between teams. On opening day, the rosters in Overwatch League will range from the absolute minimum needed to compete (six) to Blizzard-imposed limit (12). “Every player has a lot of overhead,” says Houston Outlaws general manager Matt “Flame” Rodriguez. “So the question is, are they bringing value to the roster?” But value, as it turns out, means different things to different teams. Each arrangement comes with its own pros and cons, as well as assumptions about what’s best for competing in Overwatch League. “It’s extremely rare to find a team in traditional sports that doesn’t go to the limit of their roster size,” said Philadelphia Fusion coach Yaan “Kirby” Luu. “In the NFL, that means 45 active players and a practice squad. With Overwatch League, the limit is 12 players, so it made sense to trade 12.” Luu makes this comparison deliberately: before being hired by Fusion, he coached American football in France, and that experience clearly informs his approach to managing his team. He also mentions DPS and tank coaches, inspired by position coaches in traditional sports. All that comes with a tradeoff, however. Beyond the obvious issues with overhead costs, having more players on a roster means that fewer are being utilized at any given time. 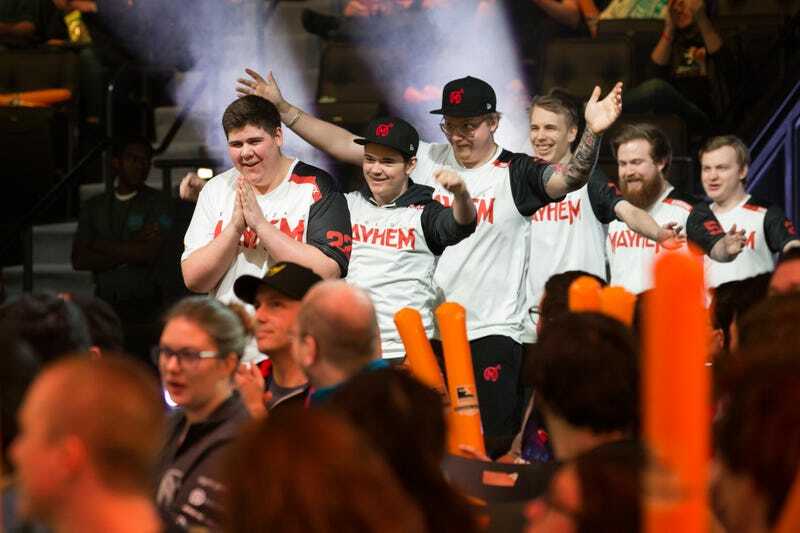 Moreover, a 12-man roster (and, yes, Overwatch League is, for now, all men) means that managers have many options when it comes to putting the on-the-field together. Constantly changing rosters, whether in practice or in official matches, makes the near-telepathic communication between a team that plays together constantly that much more challenging to achieve. And, as in any other sport, the guys on the end of the bench are unhappy. For now, most teams have split the difference. The Spitfires (on the high end) and Mayhems (on the low) of OWL are outliers, and most teams boast rosters of 9 to 11 players. This might seem like mere logistics, but those roster sizes reveal quite a bit about teams’ expectations for OWL. Deep-rostered teams are betting that the attendant flexibility will be worth the organizational hassle, and that it’s unreasonable to expect any player, no matter how talented, to stay on top of a changing game. Those with leaner rosters, on the other hand, take up the opposing viewpoint: whether due to strategy or cost-cutting, they’re hoping that the synergy that comes from a single, dedicated roster will be sufficiently meta-resistant to ensure competitive success through a long season. Teams face another impasse when it comes to national origin of their players. South Korean players are among the best in the world, but their in-game excellence comes with strings attached, both in-game and out of it. Few speak English, the lingua franca of Overwatch, which means that teams interested in Korean players are incentivized either to get an all-Korean team or try to figure out how to address the challenges posed by cross-cultural communication. “For some of our Korean players, we’re not at a point where we think they’ll be able to contribute right away purely because of language,” Yuu says of Fusion. It’s not hard to imagine that an opening day roster determined in part by language rather than in-game skill could promote tension in a team. Lee brings up an important point. Learning English isn’t strictly necessary for in-game communication on an all-South Korean roster, but for a team notionally based in London, the language barrier still presents a set of practical challenges for building a fan base that, say, a mostly North American team in Texas does not have. Overwatch League’s backers are betting that profits from local markets will someday form a significant revenue stream for teams, so building geographically-based fandom is a priority. Language can present a significant barrier to that goal. Teams with all-Korean rosters illustrate the tension between being competitive and becoming profitable. How much can a team invest into one without sacrificing the other? The team that comes closest to mastering the answers to these questions will have the best chance of dominating the actual matches. None of this, of course, is to take away from Overwatch itself, which is and will always be the main attraction of Overwatch League. Blizzard has gone to great lengths to make the game more appealing to spectators, and the level of play has slowly risen, putting to rest the idea that Overwatch’s skill ceiling is too low for serious competition. There is no right or wrong way to watch Overwatch League, and if these kinds of metagames aren’t your thing, there’s plenty of game in-game to keep you occupied. But part of what makes esports interesting is how it asks us to look in a new way at the sports we thought we knew. No matter how solidified the structure of professional sports now feels, Overwatch League is a reminder that they too were once brand new. For everything that it is or might be, OWL is already offering something compelling—a rare opportunity to watch the birth of a sport, both inside and outside the game.